About the PaceSetter Monza Exhaust Systems:The exhaust flow of an engine has a direct effect on its performance. MONZA Performance Exhausts utilize the right combination of larger than-stock, 16-gauge, mandrel-bent tubing and low back-pressure, high-flow performance mufflers for cooler, smoother engine operation and increased performance. Each system uses corrosion-resistant aluminized steel and features chrome-plated MONZA Exhaust Tips with Resonators. Comes with all hardware and instructions. Designed to replace the original equipment muffler system and, in many cases, attach to the stock catalytic converter. 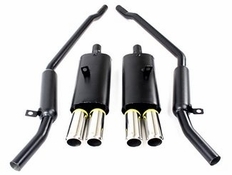 About PaceSetter Predator Exhaust Systems:PREDATOR-DUAL exhaust systems for pick ups. Computer-designed, fully-welded mufflers deliver the sound of performance while increasing your truck's efficiency. T304 stainless steel tips are polished to a show-like finish and will never rust, chip or flake. PREDATOR systems use mandrel-bent 16-gauge aluminized steel tubing and fully-aluminized mufflers that produce a deep, powerful sound. PREDATOR Dual Exhaust Systems are designed to mount using the stock hangers and mounting points and come with all necessary hardware. About PaceSetter TFX Performance Exhausts:Installs behind catalytic converter, legal in all states Ready to install, nothing else to buy. Uses original factory hangers for easy installation. Up to 12%-14% power increase at the rear wheels. 16 guage aluminized tubing Mandrel-bent for maximum flow efficiency Chrome-plated T304 stainless steel tips.